Imagine! That word alone has the ability to open people’s minds to endless possibilities. It allows us to experience alternate realities unique to our own perceptions and perspectives on the world. Most of the time when we think of imagination, we think good things. Imagination is Unicorns, flying dragons, taking a trip around the world in a rocket ship, teddy bears that can talk, cell phones (before they existed), and a man on the moon. And of course, there are well established reports and research indicating that a robust imagination is not only a healthy part of childhood, it is directly correlated to a healthy childhood. Furthermore, a healthy imagination in childhood has been linked to positive outcomes and experiences in adulthood. In fact, adults who are able to hold on to their sense of imagination are reportedly happier for various reasons. 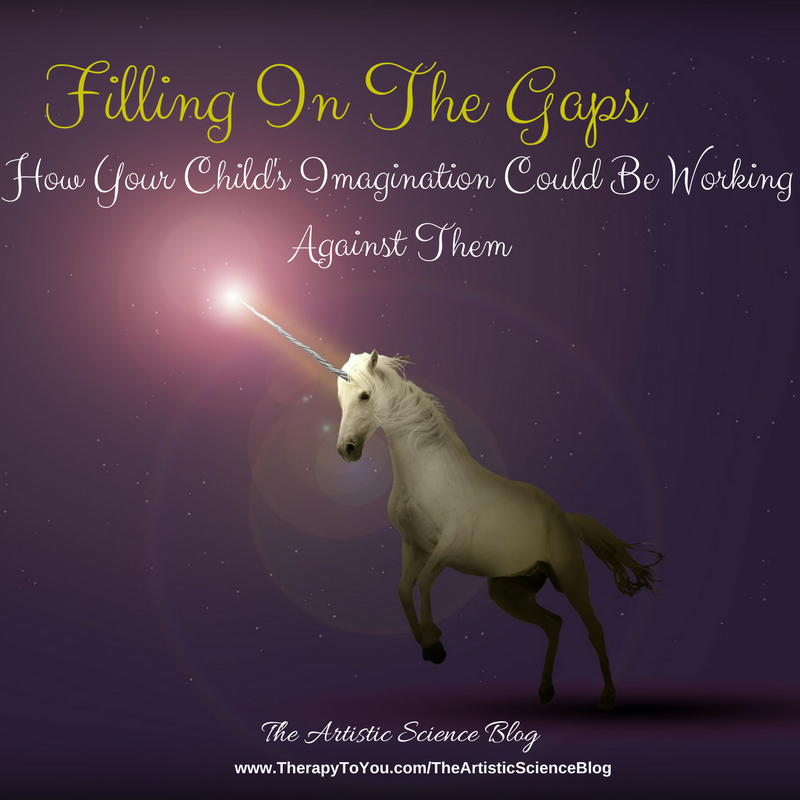 As a child therapist, much of my work is centered upon tapping into a child’s imagination as a conduit to reconciling social, emotional, and behavioral challenges. Because to them, imagination is easy. It allows us the ability to explore how they feel in a way that is removed yet still connected to their sense of self. This translates to a feeling of comfort which allows for positive change to occur more readily. What is less talked about though is how Imagination can work against a child. Especially a young one who is using their imagination to fill in the gaps as they are making sense of the world. Let me explain. Take this scenario for instance. A mother takes her child to a friend’s house for a visit. Unknowingly she parks in a Tow-Zone. So, after the visit she is shocked to find that her car is not where she parked it. She instantly becomes upset. She wonders out loud if someone stole her car. There is a look of worry on her face as she tries to figure things out. When she realizes that her car has been towed she walks back with her child to her friend’s apartment. The two of them then engage in a conversation about how tow truck drivers are constantly staking the place out. Looking for prime tow candidates. Mom makes a phone call and finds out where her car is. She then takes a taxi with her child to pick it up. This was not how mom was expecting the day to go. However, once they are back in the car things settle out. But, unbeknownst to mom the child just can’t let this go. She sits quietly in the back seat. Thinking. What’s going on here? This child has been ruminating for the past several hours on she and her mother’s experience. Specifically on the fact that tow truck drivers, whom she likely never had an experience with before, were on the hunt for cars to take. She heard what was said between her mother and her friend and her imagination took off. Filling in the gaps along the way. To her, tow truck drivers where everywhere. And since her mom wasn’t able to keep the car from being towed, it was her responsibility to make sure this never happened again. Hence the constant looking out of the window, and inability to sleep. In this example, most parents would tell their child there is nothing to worry about. That the car was safe. And perhaps explain that sometimes cars get taken because of mistakes adults make when parking or reading signs. The child would likely feel less vigilant and be able to go to sleep. Allowing their imagination to ignite again in dreamland. What about those times we don’t know about? We may not always know when our child’s imagination is working against them. Causing them to have distorted views of the world. Really, a child’s whole life is one big distortion. Fueled by ongoing brain development which impacts every aspect of their being. This benign example sheds light on the fact that as adults we often take for granted what our children take away from their interactions with us and others in this world. Also, evident in this example is the narrative that was being built by her imagination and filling in the gaps. She began to see her mother as incapable of protecting the family car. Furthermore, she felt it was her responsibility to take on this task. So it is no wonder that children build these narratives up, and can become emotionally dysregulated as a result of the immense amounts of pressure they put on themselves. Of course this is dependent on many factors including temperament and personality. This can turn into less desirable behaviors as the child is not biologically primed for these levels of worry and responsibility. So what can’t be handled internally is externalized. This happens more often than parents realize. The good news is, that children are as malleable as their imaginations indicate. So, the adults in their lives are able to intervene simply by having conversations with them. The concept of conversations is so simple yet it’s benefits are monumental. Specifically, having conversations with your child about how they are thinking and feeling helps to strength attachments (healthy/strong relationship with you), promotes emotional intelligence, and stimulates/reinforces the neural pathways that allow for us to make the connections between the biological impacts of emotion and our language capacities. Ultimately it primes the development of a well-rounded human being who is able to experience the world with more resilience and confidence. Talk to and with your child, often, about what is happening. The earlier you start this, the better. It is a well-known fact that talking to your child from infancy on, whether it be that you are giving them the play by play of your day, or reading to them, is helpful in the development and acquisition of language skills. I also believe that talking about feelings and behaviors is helpful in the development and acquisition of emotional self regulatory skills. This is especially important following an emotionally charged event. As adults, we often feel we are able to conceal from our children what we are feeling, and that may be true, but the nonverbal cues that children rely so heavily upon can betray us. So, following a particularly difficult emotional moment you may want to take some time to debrief with your child. Be sure to deconstruct things in an age appropriate way. Ask your child about their thoughts about what is happening around them. One of my favorite things about children is that often times (depending on age) they don’t have a filter. Especially when their imagination is active. They will let you know how they perceive things that are happening around them. So, you should be able to decipher whether or not to it is healthy to continue letting them believe what they believe. I started off by saying it, but it needs to be said again. Imagination is amazing through and through. And when parents tap into their child’s imagination to help them to learn about themselves and the world, the results are monumental. What are your thoughts about the influence of imagination on how children experience the world around them? I’d love to know. Leave a comment. Or contact me.